Metro Center Red Line platforms, viewed from the mezzanine. Image by Carol M. Highsmith Archive, Library of Congress, Prints and Photographs Division. Have you ever wondered what's under your feet in the District? 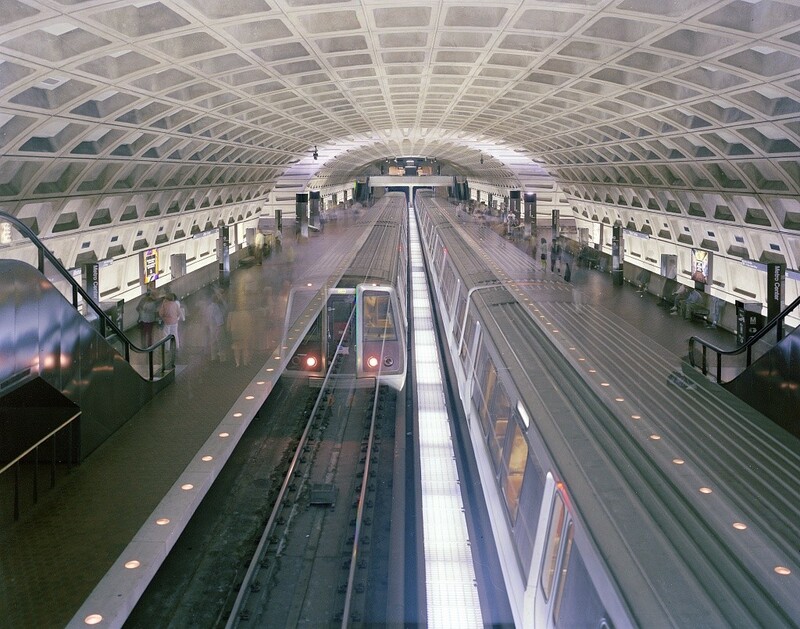 Everyone who rides Metro regularly has some sense of where the subway tunnels in the region are, but may not know that DC also has a number of former streetcar tunnels, currently-operating railway tunnels, and a collection of old automobile tunnels as well. GGWash contributor Elliot Carter's DC Underground Atlas showcases the history and engineering of this hidden underground world. Here's a taste of what he found. Right now, Metro has 50.5 miles of tunnels under the District and surrounding jurisdictions, as well as a slew of abandoned streetcar tunnels. Most riders are at least passingly familiar with Metro's tunnel routes, but few of us know much about their construction. Needless to say, this caused significant disruption to commuters and businesses. Metro workers had to be careful of things like diplomatic phone lines and NASA communication wires, to say nothing of dealing with the veins of granite and limestone. Dupont and the Upper Northwest were spared a second round of cut-and-cover construction because the local geology required the western branch of the Red Line to be built as deep-bore tunnels through bedrock. Newspaper coverage at the time talked about how irritating construction was, but nonetheless, the city was in awe of the spacious brutalist architecture when Metro finally opened in 1976 — much different from New York's cramped system. Exterior view of the C Street streetcar tunnel. Image by Elliot Carter used with permission. The District also has two other underground streetcar facilities you may not know about: the turn-back loop and station underground in front of the Bureau of Engraving and Printing, and the short tunnel on C Street north of the Capitol that was built to keep streetcars — and their wires — from interfering with the view of the Capitol from Union Station. There were also abortive plans to build a more complete streetcar subway under downtown Washington in the same style as Philadelphia's Subway-Surface Lines and the Boston Green Line. In addition to Metro and streetcar facilities, DC has tunnels for main line rail. In the early 19th Century, there were multiple freight and passenger companies vying for a share of passengers, including three companies near the National Mall. These trains could be dangerous though. “...upwards of 40,000 pedestrians a year were hit by trains at the turn of the century, a death toll on par with warfare,” Carter writes. The oldest of these, the 1870 Virginia Avenue Tunnel, has been in the news in recent years because it is currently being rebuilt to increase capacity by allowing double-stack freight trains. This tunnel allows trains to bypass downtown DC by running south of the Mall. It was originally the only connection between northeastern railroads and Long Bridge over the Potomac, which allowed direct rail service to Alexandria and points south. The First Street Tunnel, which connects the through-running tracks at Union Station to Long Bridge by running just east of the Capitol, was built around the same time in the first decade of the Twentieth Century. 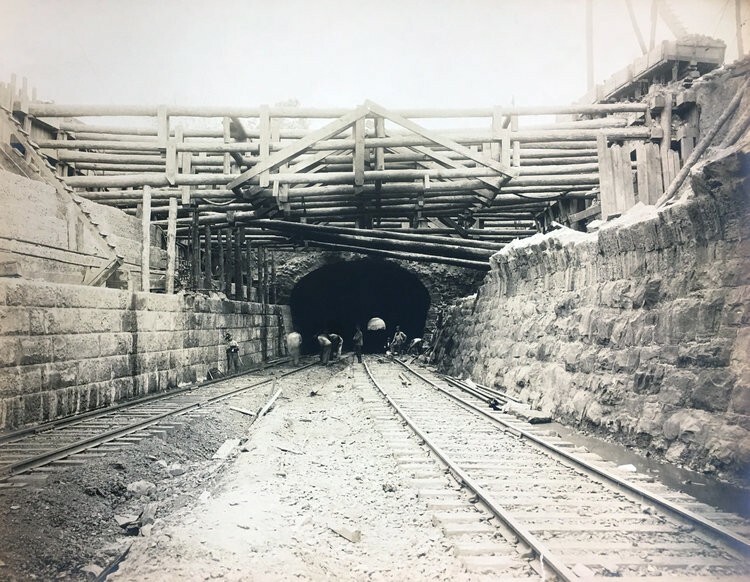 Workers near completion of the Virginia Avenue Tunnel circa 1906. Image by Library of Congress Prints and Photographs Division. The First Street Tunnel and the extension of the Virginia Avenue Tunnel were both part of the 1902 McMillan Plan to beautify and improve the Mall and surrounding areas. The tunnels, along with Union Station (which was constructed at the same time), allowed the city to remove railway tracks from streets in the District's monumental core and eliminate competing railway stations on the Mall. In addition to thes tunnels, however, Carter mentions a third tunnel I'd never heard of before: a stub-end tunnel that was built to connect an underground platform at the Bureau of Engraving and Printing to the railway network. This tunnel was the result of World War II fears of Nazi saboteurs, and was intended to allow cash trains headed for the nation's Federal Reserve banks to be loaded in a more secure environment. However, tunnels aren't limited to transit — the District also built automobile tunnels to unsnarl bad traffic. The first ones under Scott and Thomas Circles were built in 1940, while the longer tunnel under Dupont Circle was constructed after World War II. They were built based on the assumption that most car traffic into downtown came from the north and northwest. The Pentagon concourse in 1944. Image by Department of Defense. There's another, much less-known tunnel built in the 1940s: the five-lane bus tunnel built under one side of the Pentagon to provide a bus station for commuters inside the building. However, unlike the tunnels under the District's traffic circles, these tunnels were bricked up and converted to office space in the 1980s due to concerns about security after the bombing of the US Embassy in Beirut. Tunnel construction resumed again in the 1960s, when several tunnels were built in Foggy Bottom to serve traffic entering the city on the Whitehurst Freeway and I-66. The tunnels under the National Mall were also built in the 60s as part of the construction of the wall of elevated freeways isolating Southwest from the rest of the city. The construction of the Center Leg freeway in the 1970s and 1980s completed Washington's set of freeway tunnels. Funding issues and the freeway protest movement resulted in many of the city's planned freeways being eliminated to fund the construction of Metro, and saved the District from having even more freeways cutting through the city. The articles on transportation-related infrastructure are complete, but the DC Underground Atlas isn't finished. Utility tunnels — including water, steam, and sewer — are up next. Are there any tunnels under the District that you're particularly interested in learning more about?